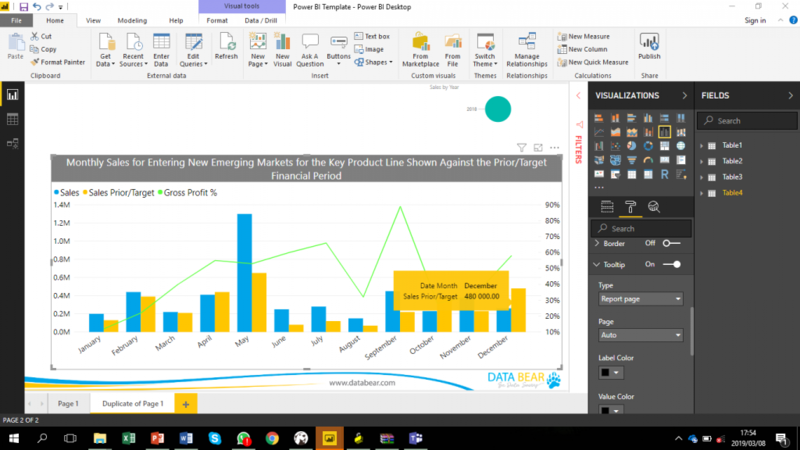 March sees another exciting release for Power BI Desktop. 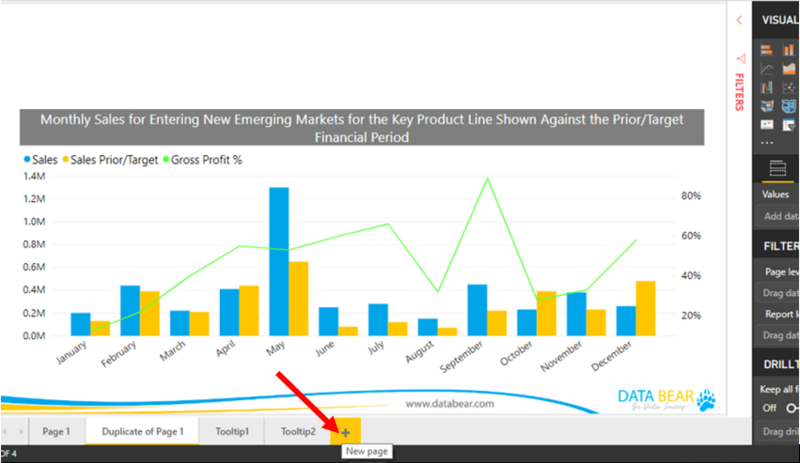 There are great additions to reporting in Power BI, especially with the addition of the Report page tooltips (preview). Analytics sees some improvements to Q&A with the ‘did you mean’ functionality as well as some formatting updates for maps. 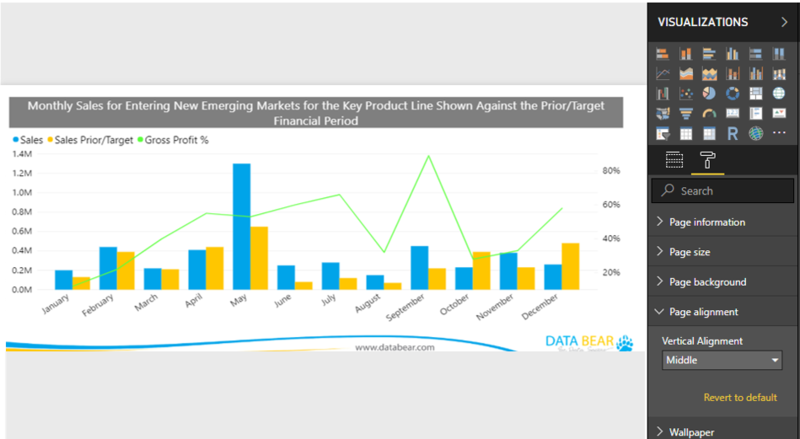 We will cover these and more topics in our March Power BI Desktop post. 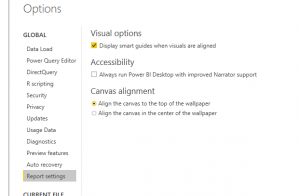 The tooltip is the popup when you hover over a visual on your Power BI report. You are now allowed to format the tooltip to suit your formatting requirements. You’ll find all these settings in the tooltip bucket of the formatting pane. You are able to change the background colour of your tooltip as well as the colour of your text. We will go through detailed steps on how to create the tooltip as it can be a bit confusing if you are creating a custom tooltip for the first time. Start on an entirely new report page. 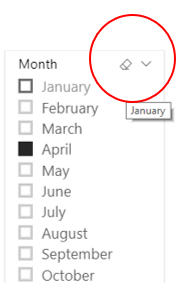 You can do this by selecting the + button at the bottom of the Power BI report. The reporting tooltip can be of any size, however, it is advisable to keep it small as it is a ‘popup’ when hovering over the report canvas. 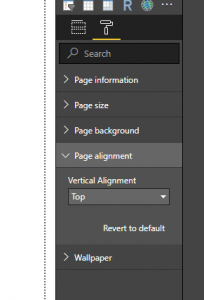 Power BI has built-in under Page Size a template size for your tooltip called Tooltip. 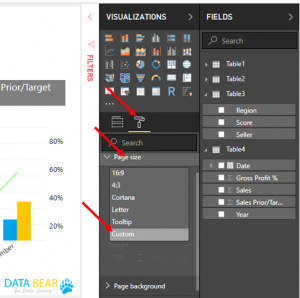 Power BI will default your reporting canvas to the available space on your page, however, to get a true sense of the size available for the tooltip it is better to view the actual size of your page. To do that, select the View tab from the ribbon. From there, select Page View > Actual Size. It is always good with reporting to maintain good naming conventions. To name your tooltip select the Page Information card in the Format pane, then type the name into the Name field. Let’s practically see now how the tooltip is used. The Tooltip can be used in visual in two ways. Setup tooltip to display when using a certain field, category, measure or numeric column. When using the field etc that is tied to the tooltip, the tooltip will be displayed when hovering over the visual. Link the tooltip to a specific visual. We will first explore how to link the tooltip to a specific field, category, measure or numeric column. For our first example, we want the tooltip to show up in a visual when the visual contains the sales amount. Firstly, you need to set up the Tooltip page as explained in the first part of this blog. Navigate to the fields of your Tooltip page and insert in our case the Sales field in the Tooltip area. 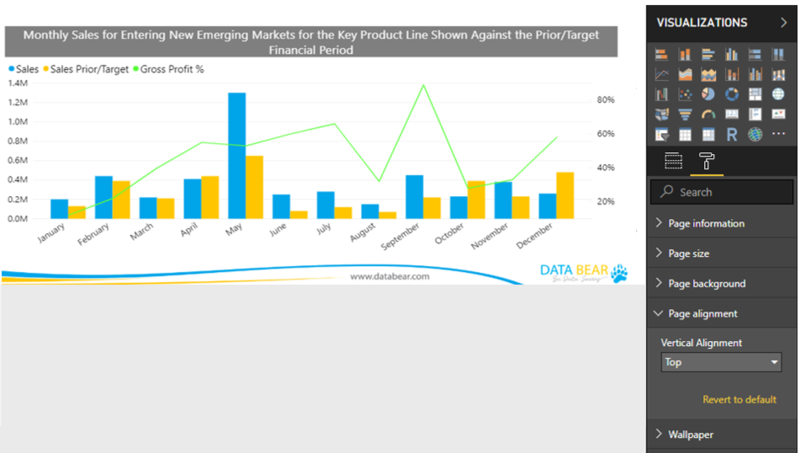 If we go back to our Sales page we can see that when we hover over our Monthly Sales VS Prior/Target line and clustered column chart the Tooltip created are displayed on top of the chart. Another thing to note here is that the Tooltip will filter with the data that you select on your visual. This is a really handy tool to directly see the interaction between different datasets. The second way to use a tooltip on a visual is when you would like to have a specific Tooltip for your visual rather than the generic one we linked to any visual with the Sales field. All you need to do is navigate to the Format pane of your visual and under Tooltip select the Tooltip you would like to be displayed when hovering over the visual. Here you can see the new Tooltip, Region being displayed on the visual. The Single select slicers have been updated so that support radio buttons where it will allow the selection of one and only one slicer value. When using the drop-down slicers, the drop-down will close after one of the slicer values is selected. This is a simple yet effective improvement that allows the interaction much more speedy for end users. There are times when you would like to have a link to a webpage in your report when presenting your data. A static web URL can now be added to an image, shape or button. 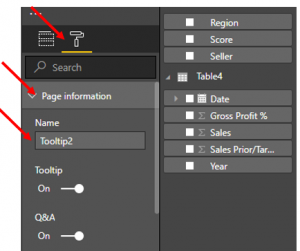 On Power BI select an image, button or shape and then in the formatting pane select action. Select the Type action and enter a valid URL. In your report, ctrl+click will navigate you to the link. 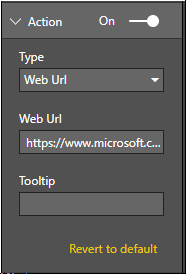 In Power BI service you can just click on the image or button and the web link will be opened. To activate the filter pane improvement you need to go to the options dialogue, preview features, New filter experience. End users of the report can no longer delete a filter card but can access a clear button allowing the end user to easily fix a report if incorrect filters were selected. The frustration of misspellings or misunderstanding of the Q&A functionality has been improved where Q&A pop up dialogue now includes “Did you mean?” suggestions for improved results. Ambiguous terms will also be highlighted with the recommendation showed. Whether you see ‘Did you mean’ or ‘Showing results for’and click on this it should replace the text in the textbox and show a visualization for the new selection. Avery useful update has been added for dates. In the past when you dragged dates you had to adjust your filtering in your visuals field. 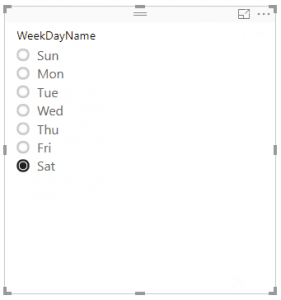 Now you can directly select in what data format you would like your dates to be from your data table. Now the entire hierarchy or a specific selection from the hierarchy can be used in visuals. The bubble sizes on you Bing maps is now adjustable, this is a really handy feature to display your data on a map completely to your liking. It is really simple as you only have to slide the Size control under the Bubbles card to the left to reduce the size and to the right to increase the size. 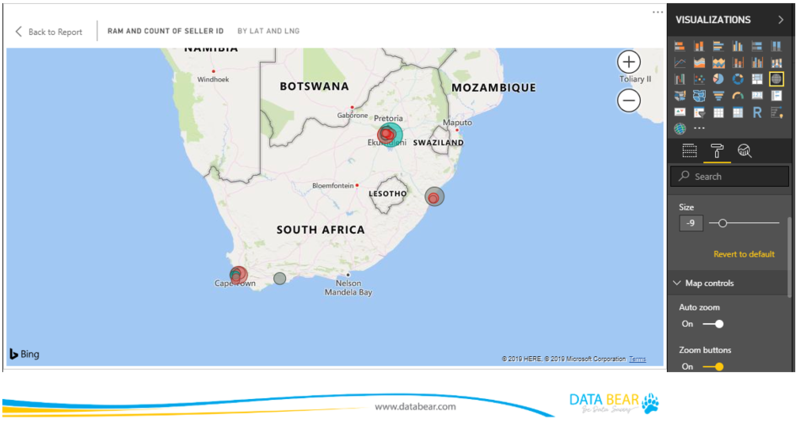 Power Bi has also made it easier to zoom on your map by adding the functionality to add zoom buttons to your map. This functionality can be turned on through the Zoom buttons toggle under the Map controls card. 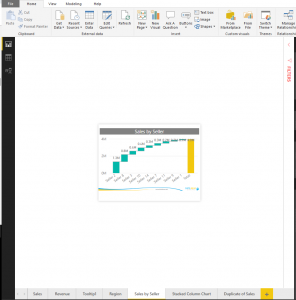 Please see Power BI latest March Update for more information on the above features.